In an attempt to answer that question, he and his wife relocated to Boystown, a predominantly GLBT community in Chicago. And from his experience and wrestling has come his book, a work which elevates the conversation between Christianity and the GLBT community, moving the focus from genetics to gospel, where it really belongs. Why are so many people who are gay wary of people who are Christians? Do GLBT people need to change who they are? Do Christians need to change what they believe? is changing the conversation about sexuality and spirituality, and building bridges from the GLBT community to the Christian community and, more importantly, to the good news of Jesus Christ. Much of today’s culture defines bridge building and reconciliation as a one-way street that leads to full theological, political and social agreement. Yet Christ demonstrated a different path of religious and cultural engagement to establish his kingdom here on earth. In light of such countercultural principles, the Christian community needs a new view on the issues that divide conservative believers and the lesbian, gay, bisexual and transgender (LGBT) communities. 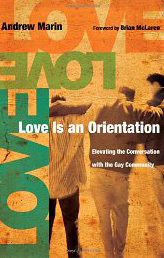 Using the practical applications Andrew Marin has learned over the last decade of living and working in the LGBT neighborhood of Chicago called Boystown, as well as his international speaking and consulting ministry, this six-session, video-based study offers a variety of practical teachings, insights and life lessons. Rather than avoiding the topic of homosexuality, Love Is an Orientation aims to equip the Christian community to bridge the gap between LGBT and religious communities. This is not a group study about ‘fixing’ gay people. It’s about getting to know them, engaging them, and loving them like Jesus does. 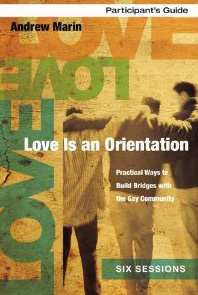 After this study, you, your small group and your church will know what it means to peacefully and productively build bridges with the LGBT community. “Theology of Embodiment as Healing between the Church and LGBT Community” in Doing Theology for the Church’s Mission (Winter 2015, forthcoming) by Wm. B. Eerdmans. Edited by Tom Noble and Jason Sexton. Matthew 10 in The Way Bible (March 2012) by Tyndale Publishers. Edited by Mark Ostriercher.